Tomorrow evening at the CopaCabana in the Grand Hyatt will see the latest instalment of The Experiment's Wonderland party series. 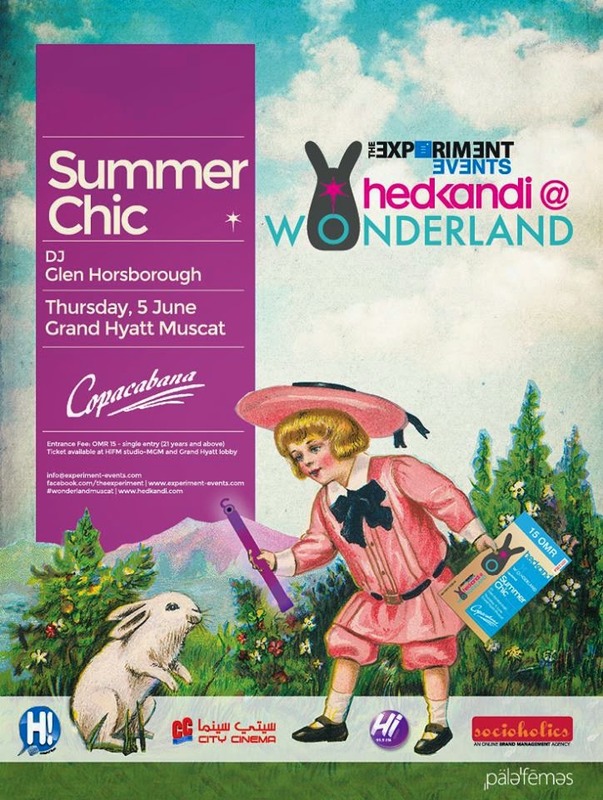 They're bringing Hed Kandi back to Muscat once more, with tickets at RO 15 and Hed Kandi's DJ Glen Horsborough will be working his magic on the night. Tickets are still on sale, and you can get them either from the Hi FM studios at Muscat Grand Mall, or from the lobby at the Hyatt. You can check out the facebook event page for more info. Some of you reading this might be thinking yeah - but the Copa has a bit of a bad reputation - this is a private event and the door policy is strictly controlled by the event organizers - no ticket, no entrance. Congratulations to Rodney Woods, you won the pair of tickets - check your email for instructions on how to claim them. Thanks all, and be sure to get into the Chedi competition too.